Bad news is the ultimate unwelcome house guest. Trouble is, we have no control over when it arrives or how long it stays and finding the silver lining in bad news can be a challenge. I mentioned in my post on Monday that my daughter’s dad just got some bad news about his health. Really bad news. Well, the final diagnosis is in: stage 4 melanoma with secondary cancers in his brain, lungs and liver. The harsh reality is that his days are numbered. I have to admit that even though he and I divorced over 13 years ago, this news has shaken me. My dad died of pancreatic cancer about five years ago and knowing that my daughter’s dad is about to suffer through a similar experience fills me sadness. If I’m looking for silver linings though, it has also forced me to assess my own health. I’ve been a single parent for the last 13 odd years and it’s challenging at the best of times. Now, I’m facing the daunting prospect of being an only parent. How is the prospect of being an only parent changing my view of my world and my future? It means I can no longer take my health and well-being for granted… I need to be around for a long time and I need to be fit and healthy, too. It’s already as good as guaranteed that my ex-husband will not see his daughter graduate from university, will not walk her down the aisle at her wedding, will never know her future children… My dad was a big part of my life and I can’t imagine those huge life events without his presence. For me, finding the silver lining is this: it’s the reminder that none of us is guaranteed a long life and it’s up to us to take responsibility for making the most of each and every day. Right now, for me, that’s about taking responsibility for my health. To achieve that end, I’m adding another step to the process of attaining a simple and streamlined life: looking after my health. Frugally, of course. The best way I know to begin working toward being healthier is to get back to my ideal weight. Stress and sleeplessness (A.K.A. Single Parenting) has added extra and unnecessary bulk to my frame over the years and it has to go. Rather than restricting my diet (because I’m not good at depriving myself) I’m going to add to it instead. So, my next 30 day challenge (and hopefully beyond) is to add a minimum of seven serves of vegetables to my diet every day and a minimum of six glasses of water. I’m not expecting a miracle in 30 days but it will start building the foundation of a new healthy habit. A foundation upon which other healthy habits can be built. I’m also not going to go overboard and add all sorts of additional tasks or activities because I’m pretty sure that will only undermine my overarching objective of a simple and stream lined life, I’ll feel overwhelmed and stressed and give up. And, giving up just isn’t an option. Finding the silver lining in this very sad news is taking the opportunity to look at my own health seriously. Something many of us take for granted, every single day. My ex-husband has a very good job and makes very good money but he’s always lived life like he’s trying to impress the world. I think it’s more important to impress yourself by living life on your own terms, chasing dreams that set your imagination on fire and knowing you’ve made choices based on your own values, not someone else’s. Have you had to face something similar? Where and how did you find your silver lining? I’m sorry to hear about your ex! It’s always difficult to get tough news like that. It’s great how you’ve turned it around to improve instead of freaking out and wallowing in the negative. I’m working on my healthy habits as well so feel free to reach out for a support buddy! Thank you… I’m doing my best to wring out the positives. And, if I drink much more water today, I have to wring myself out! Ditto on the support buddy!!! I’m very sorry to hear about your daughter’s dad. My cousin Kathy died of pancreatic cancer earlier this year and it also made me reassess my health. I’m so sorry for your loss, Holly. Pancreatic cancer is a nasty one. Apparently it’s often stage 4 before it’s found. My aunt died from it, too so I get a range of blood tests done ever couple of years. I need to get a lot better at managing the day to day stuff though. Too many doughnuts not enough salads! A great silver lining from a tough situation. Absolutely agree that, “… it’s up to us to take responsibility for making the most of each and every day.” I have long believed that each of us should work every day to improve ourselves in four key areas: physical/health (e.g. get in a morning run), fiscal (e.g. if I eat lunch out, drink water instead of soda … it’s less expensive plus it supports the first area, physical/health), mentally (e.g. continue reading a book) and spiritually (e.g. do something to build/improve a relationship with a friend/family member). We only get this one life, we might as well make it great! Very sorry to hear about your child’s father. That is sad news for sure. Im super glad to hear though that you are turning your health around because of it. Its kind of sad to see but most people need a drastic event to happen like this to realize how important your health is. Glad this happened to you sooner then later. Thanks Alexander. Unfortunately some of us (me!) need a kick in the shins before we take notice. Health is like money, most people don’t appreciate it until it’s gone. I’m sorry you and your family our dealt this difficult hand. You are a strong person for finding the silver lining and taking action to improve your health. 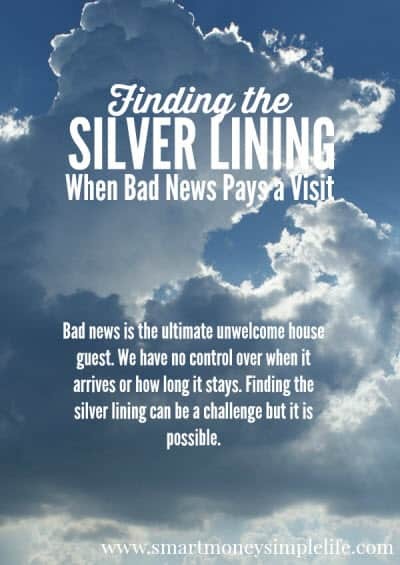 I actually kind of hate the term “silver linings” just because all too often people are using that in order to gloss over the awfulness and only focus on what they’re comfortable with. But it sounds like you’re not doing that. You’re realizing the awful, but trying to do what you can in the situation. By that logic, my silver lining is that having a very severe illness gave me PTSD (which isn’t the silver lining) which propelled me into much-needed therapy. That forced me to deal with a few things, including pre-existing depression, and gave me the self-awareness/strength to rid myself of a very toxic person. I honestly don’t know if/when I would have gotten help had I remained healthy. You’re right. Too often it is used to distract focus from the situation. Wouldn’t it be nice if we could come to those realisations without the [you know what] needing to hit the fan first? I hope you’re well on the way to recovery now.